This sort of law allows employees to request flexible working arrangements, requires employers to respond in writing, and allows employers to refuse the request if they give a business reason for refusing. This sort of law has been successful for over a decade in the United Kingdom, where the overwhelming majority of requests are granted. Stricter laws have been successful in the Netherlands and Germany. 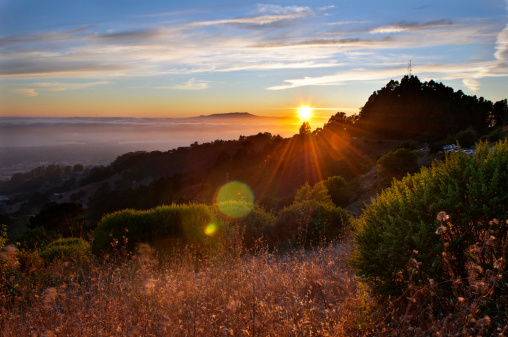 Now, the United States is catching up: Vermont and San Francisco passed right-to-request laws in 2013. Existing laws have emphasized the benefits to families. Our 40-hour week dates back to the 1930s, when families were expected to have stay-at-home mothers. Today, most families do not have a stay-at-home parent, and 90 percent of those families say that they have difficulty balancing their work and family obligations. If people choose to work less and consume less, common sense tells us that they will also pollute less. Studies have confirmed this fact: for example, a 2013 study by the Center for Economic and Policy Research found that if the world followed a model of work time similar to West Europeans rather than the American model, it could eliminate as much as one-half of the global warming that is not already inevitable. We want to raise a fundamental economic question that mainstream politicians have not mentioned since the 1930s: should we use our increased productivity to consume more or to have more free time? We can consume more. For example, if productivity increases by two percent a year, we can consume two percent more each year. We can work less. For example, if productivity increases by two percent a year, we can reduce work hours by about two percent less each year. We can do some combination of the two. For example, if productivity increases by two percent a year, we can consume one percent more and work about one percent less each year. During most of American history, we did number three. As you can see in the following graph, American work hours declined steadily from the beginning of the industrial revolution until the Depression. 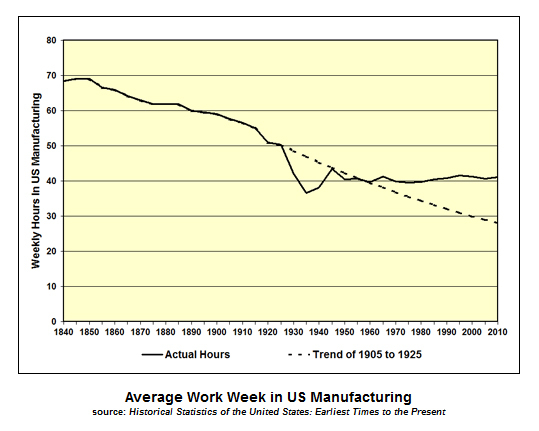 Hours stopped declining only during the post-war period, when we started stimulating the economy to provide more jobs. In Europe, work hours are still declining. 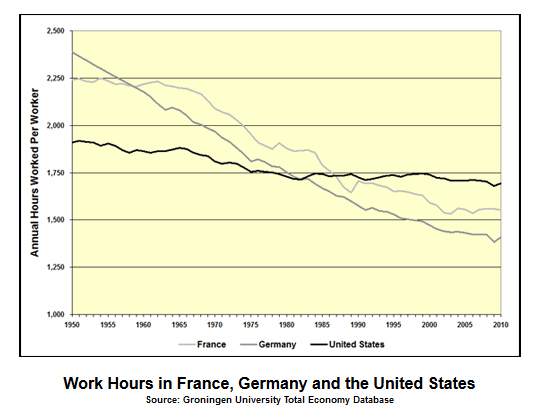 As you can see in the following graph, Germany and France had much longer hours than the United States in 1950 but now have much shorter hours. Germany has shorter hours than France, and Germany is the economic powerhouse of Europe, more successful economically than the United States in many ways. The average German has an ecological footprint of only 5.08 global hectares, compared with 8 global hectares for the average American. Germany is famous for promoting clean energy, which will make its footprint much smaller by mid-century, but currently, its smaller footprint depends as much on its shorter work time as on its cleaner economy. My book The Politics of Simple Living includes projections that show that the world will have a much better chance of avoiding ecological collapse during this century if we follow the German model (and the historic American model) of gradually reducing our work time rather than following the post-war American model of using all of our productivity gains to increase production and consumption. To avoid ecological crisis and move toward a world where everyone has a comfortable standard of living, we in the developed nations must decide that we want to benefit from increased productivity in a balanced way, with more free time as well as more stuff.